The New South Wales Ministry of Health has tried to stop nurses and midwives from participating in an important academic study into ratios. 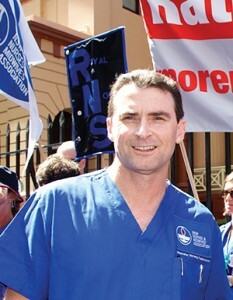 NSWNMA General Secretary Brett Holmes says that, despite directions from management not to participate in the research, nurses and midwives are entitled to have their say. “It has become clear that not only does the Ministry of Health fear the result of the research into ratios, they are attempting to stop nurses and midwives from expressing their professional opinion,” he said. “Any direction could only apply to paid work time and nurses and midwives could legitimately complete the survey in their own time using their own computer, tablet or smartphone. The Ministry’s heavy-handed tactics have not succeeded. Despite the obstacles put in their path over 2700 nurses and midwives completed the survey providing a strong, statistically significant base for the research to continue.